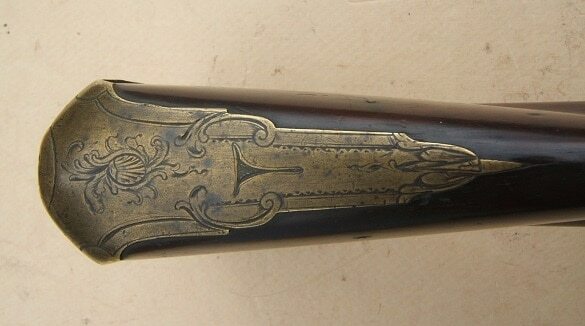 A FINE GEORGIAN/COLONIAL PERIOD ENGLISH/IRISH FLINTLOCK “OFFICER’S” FOWLER, by F. LORD, ca. 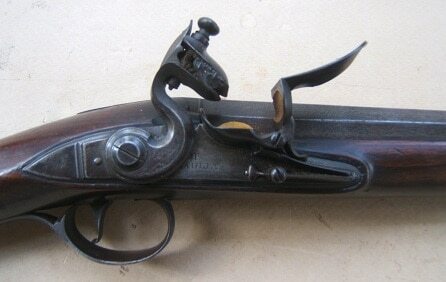 1750:: In overall fine, original flintlock condition. 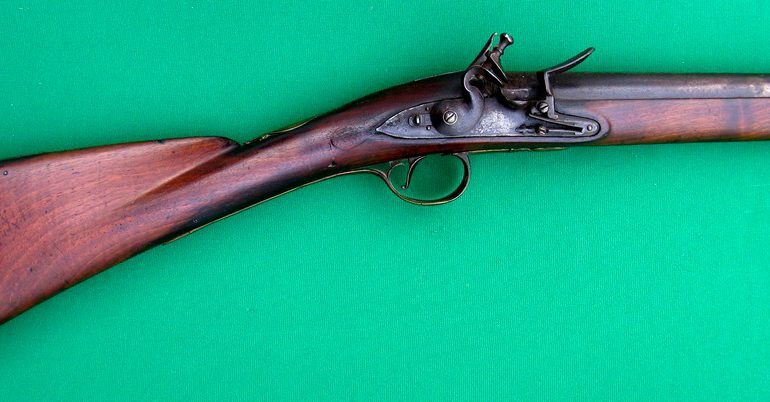 London Gunmaker Co. proof marked, round, smoothbore, key-fastened, 43″, (10 Ga.)/.75 caliber, slightly-flared barrel with a scroll-engraved “hooked” breech with tang-type rear sight and its teardrop brass fore-sight. 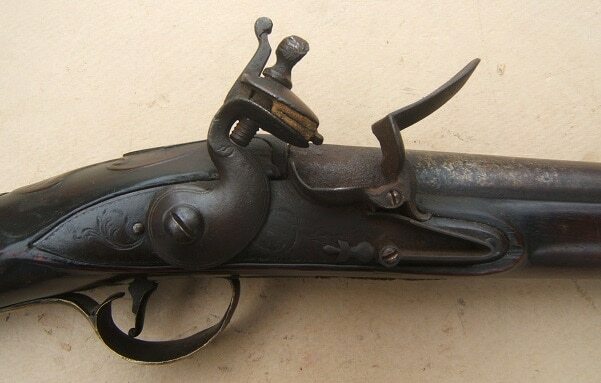 Retains an untouched, generally smooth, brown age-patina with some light discoloration and fine scattered pitting: marked on the breech-top with an “F. LORD” maker’s signature; and on its left side, with two early London Gunmaker Co and an “R.W.” (Richard Wilson) barrel-maker’s mark. 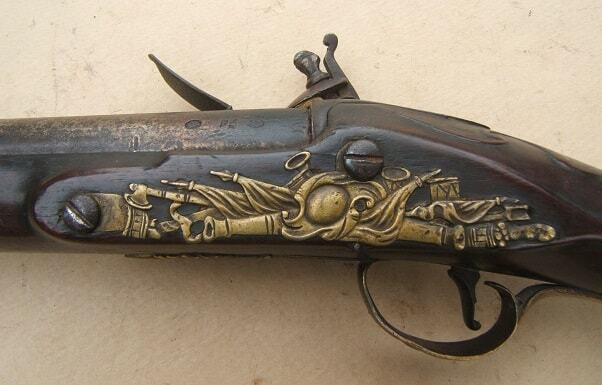 (Francis Lord of Dublin, Ireland was a gunsmith and Contractor to the British Board of Ordnance, who worked 1745-1774. Please see E. Heer’s: “Der Neue Stockel”, vol. 1, pg. 726). The barrel-tang etched and engraved with fine quality scrolls, en suite with the lockplate. Molded and carved, nicely figured, English Walnut fullstock of classic Georgian form with a sculpted and deeply fluted comb and a finely executed raised carved scallop-shell apron, at the barrel tang: raised teardrops around the mounts and lock. High quality, embossed and engraved brass mounts with untouched mustard-toned surfaces with some patches of discoloration and light wear. 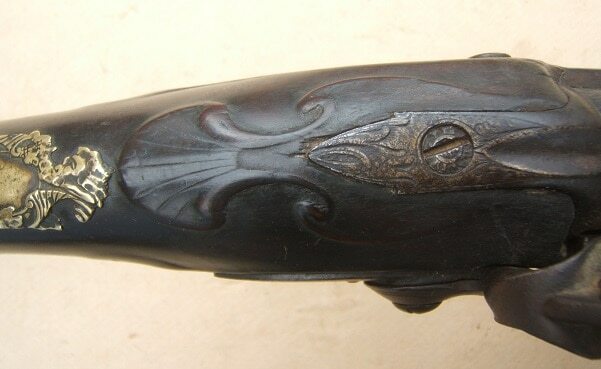 The trigger-guard with a finely etched and embossed acanthus leaf forward finial and a deeply fluted bow with an embossed scallop-shell accent. The buttplate with a stepped and finely engraved tang with etched vine scrolls. Three (3) barrel-form ramrod pipes, a vacant wrist escutcheon with finely embossed borders; and the embossed Martial theme sideplate with full Stand of Arms. The mounts of classic mid-18th Century English martial theme design and therefore, most likely used by an Officer. Fine quality lock with deeply patinated steel surfaces with scroll engravings, under the powder-pan and behind the hammer, en suite with the mounts and barrel. In mechanically functional order with a strong mainspring and fine timing. The lock with its bridled powder-pan and thread-engraved borders: the gooseneck hammer, frizzen and trefoil finial frizzen-spring, en suite. In overall fine untouched condition with dark metal and wooden surfaces. The barrel with sharp contours, a fine touch hole, clear markings and generally smooth surfaces. The stock with a fine grain pattern, 85%+ finish, sharp contours, fine quality rococo type raised carvings and some expected handling marks, signs of use and light wear. Fine lock/mechanism with untouched, dark, steel surfaces and its original components: original jaw-screw with damaged slot. A very nice example of a Classic Georgian Period English/Irish Officer’s Fowler, ca. 1750. Plain wooden ramrod. For similar examples, please see G. C. Neumann’s: “Battle Weapons…”. Overall length, 58″.